Krešimir was born in Sibenik and lived in the area for 20 years, then moved to Australia for 10 years. 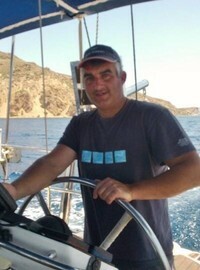 Now back in Croatia you will find him skippering on our tours on the Dalmatian Coast and Kornati Islands. As with many of our boat pilots, they enjoy the sea not just on the boat but in other activities as well. 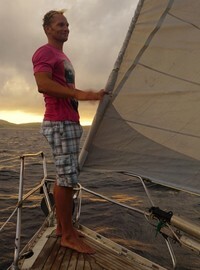 Krešimir was part of a Croatian Windsurfing team and competed for 12 years. He also enjoys free diving, spearfishing and swimming. Krešimir has been skippering for SwimTrek in Croatia since 2015. Antonis and his crew Yannis and Joanna have a beautiful and relaxing 50 foot sailing yacht. They like nothing better than showing off the cliffs, caves, nooks and crannies of the Milos coastline. If the conditions are right, Antonis raises the sails for the wind to fill and take you home after your day’s swimming. Antonis has been skippering for SwimTrek in Milos since 2015. I started kayaking as a teenager on the River Dee in Chester and trained as an outdoor instructor in the Lake District. Since then I have led a variety of adventurous activities here in the UK, as well as in New Zealand and Australia. As a freelancer, I work with all age groups and in many different environments so an average week might well involve ghyll scrambling, abseiling or climbing, a mountain experience of some sort, and some canoeing or kayaking on white water. I have a particular interest in working with cold water swimmers: this began in 2007 when I first provided canoe support for Swim Trek trips in the Western Lake District. I have also worked independently supporting long distance swimmers; 'extreme triathletes'; those training for particular events, including Channel crossings, and social swimming groups keen to be guided in lochs, lakes and rivers. In my spare time, I plan adventures of my own – most recently on the West Coast of Scotland in an open canoe – and my companion on the water was a Chocolate Labrador, Bruno, who has met many swimming groups and has featured in the infamous Swim Trek Photo Gallery! You may be pleased to know that I can also swim and I thoroughly enjoy swimming in wild places up high in the hills, amongst the breaking surf and in Lakeland rivers.